Trying to speak about Mexican cuisine as a whole can result in a vague explanation. Indeed, if we take into account the fact that Mexican territory has an area of almost 2 million km2, which is composed of a variety of ecosystems (from the jungles to the deserts), we can understand how every region developed its own cuisine based on local ingredients. This makes Mexican cuisine one of the most colourful and varied of the world. 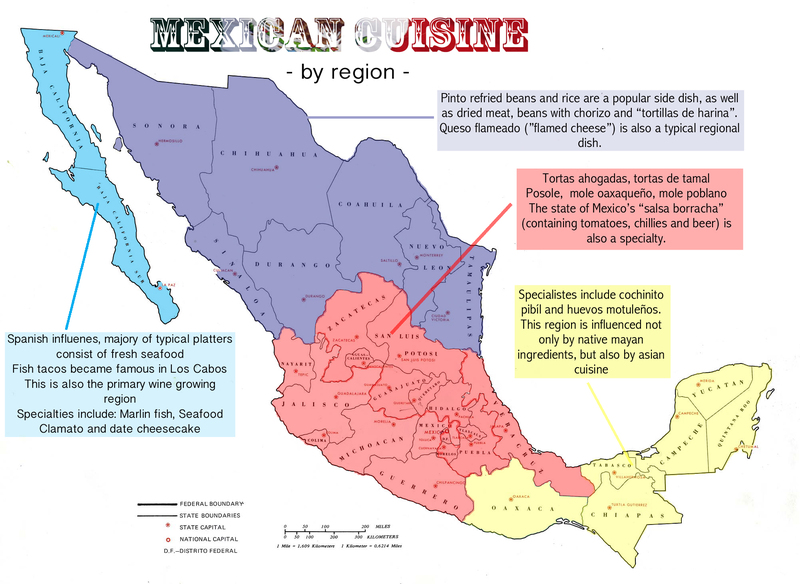 Therefore, there are Mexican dishes ranging from roasted baby goat paired fried beans in the northeast, “ceviche” or fish tacos in the northwest, a delicious “pozole” soup in central Mexico or roasted suckling pig in the south. However, we can cite three basics elements, which appear in all the different regional cuisines: corn, chillies and sauces. Corn is to Mexico what cows are to India: sacred. It is used in different ways: dry, fresh, corned, ground… the list goes on. It is mainly used in stews, tamales, soups, atoles and, of course, in corn flour, used to prepare tortillas and various other dishes such as sopes and tlacoyos. Mexico possesses a wide selection of corn: yellow, white, red and blue corn all grow in Mexico. Chillies are used in Mexican cuisine mostly for their flavour rather than for their spiciness (which can be adjusted to suit everyone’s taste). This is why Mexican food is not always spicy, but rather, full of spices. Combining the flavours of a wide array of chillies is an art: this gives a unique personality to Mexican cuisine. Chillies can be used fresh or dried, as a base for sauces or as a dish in itself. Mexican salsas are unique in the world, because unlike many other sauces (such as French sauces), they don’t use cream or butter, but are prepared with chopped or blended vegetables, which are used raw or cooked. There is an infinite variety of “Mexican salsas”, which vary depending on the combination of chillies used. Some salsas are used to accompany or flavour a platter; other salsas are indispensable to the dish, as is the case in moles and adobos. this food is wonderfull and colorfull,besides having different festivities where some dishes are especifically served……….wonderfull!!! !